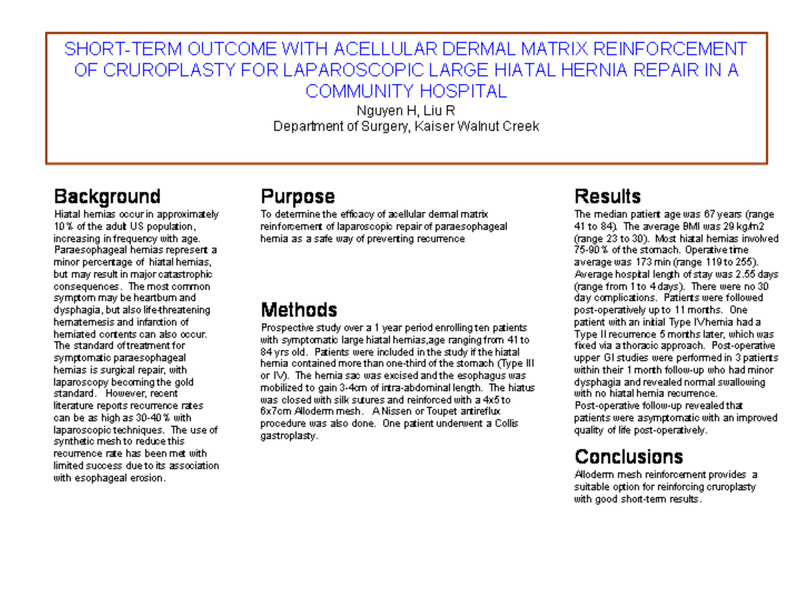 Objective: To determine the efficacy of acellular dermal matrix reinforcement of cruroplasty for large hiatal hernia (HH) repairs. Method and Procedure: Prospective study over a 1 year period enrolling ten patients with symptomatic large HH. Patients were included in the study if the HH contained more than one-third of the stomach (Type III or IV). The hernia sac was excised and the esophagus was mobilized to gain 3-4cm of intra-abdominal length. The hiatus was closed with silk sutures and reinforced with a 4×5 to 6x7cm acellular dermal matrix mesh as a single on-lay with a window cut to accommodate the esophagus. A Nissen or Toupet antireflux procedure was also done. One patient underwent a Collis gastroplasty. Result: The median patient age was 67 years (range 41 to 84). The average BMI was 29 kg/m2 (range 23 to 30). Most HH involved 75-90% of the stomach. Operative time average was 173 min (range 119 to 255). Average hospital length of stay was 2.55 days (range from 1 to 4 days). There were no 30 day complications. Patients were followed post-operatively up to 11 months. One patient with an initial Type IV hernia had a Type II recurrence 5 months later, which was fixed via a thoracic approach. Post-operative upper GI studies were performed in 3 patients within their 1 month follow-up who had minor dysphagia and revealed normal swallowing with no HH recurrence. Conclusion: Alloderm mesh reinforcement provides a suitable option for reinforcing large HH cruroplasty with good short-term results.